At this point, April 2013, there has been little field interest in my proposal. If some NFP boards are interested in conducting a trial or experiment with the idea, I would be delighted to be in contact. Please send me an e-mail at frameugene@gmail.com . 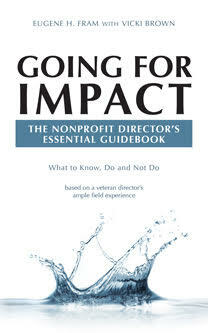 Few nonprofit boards do a great job of overseeing their organizations. Both nonprofit board members and CEO’s share that concern: Asked to rank their performance with academic-style grades by the nonprofit group BoardSource, chief executives gave their boards a “C+” grade, while board members gave themselves a “B” grade . The use of such directors became popular as a way to deal with the public concern about the business world that prompted passage of the Sarbanes-­Oxley law in 2002. That legislation spurred the New York Stock Exchange to enshrine the idea of lead directors as a way to show that a company was well governed. Given how time consuming it is to serve as a nonprofit board chair, especially of a complicated organization like a university or hospital, it seems logical to empower another volunteer to formally fulfill some of the responsibilities expected of a board chair. At first glance, adding a lead director to the structure of a nonprofit board seems like formalizing a position in a way that could impede the relationship among the chair, the CEO, and other board members. The lead director should be viewed as just the opposite, as the business world has demonstrated. H/she can help the CEO work more effectively and efficiently with board committees, especially in driving the work of the strategic-planning groups. What’s more, the lead director can be an additional consultant or mentor to the CEO, especially when the board chair is unavailable. Because the lead director would help the board run better, this move could also do much to build morale at nonprofit groups. I think this is a great concept and the introduction of a Lead Director into most non-profits could make a huge difference. The role of Lead Director as outlined is a real departure from the established governance model that NFP organizations have worked to since their inception. The successful implementation of this new model would be a real challenge to many organizations that may see this as a criticism of their performance. This is a multi-skilled and multifaceted position that most would find daunting (more than most are prepared to do). To support prospective Lead Directors there would have to be a specific and quite intense training programme (although I hate to use qualifications in respect of board members in the NFP sector this role could call for this level of commitment and validation). I believe that the title (Lead Director) is unhelpful in the NFP arena due to the connotation that a board member has a higher role than others and is a possible barrier to organizations looking at this model. I will continue to use the title in my response, but strongly recommend a change of title (still with director in it). The relationship with the Chair and other board members needs a Lead Director to have great people skills, otherwise there is a danger of a “Big Brother” feeling developing. There also needs to be clear lines of demarcation between this role and that of others such as Company Secretary. I feel that as each of the identified roles in your article are developed for the NFP sector; they are built into a framework document for Lead Directors that contains a set of guidance documents, good practice examples and reference points. I see a real need for flexibility of approach within a strong framework as an essential factor in the successful delivery of Lead Directors. There is a challenge in trying to sell this to a sector that does not have a great deal of confidence in its boards. The NFP sector sometimes need a proven model before they will adopt new thinking, this could be delivered through a pilot programme either delivered through academic means or by attracting funding or private sector support, this would probably take three years to design, implement, trial and evaluate. If the value of having a Lead Director can be established and then championed by those in the pilot, the sector is far more likely to adopt this. It is a shame that non-profits have not as yet seen the benefit of this but as with all new ideas a level of marketing/promotion is needed before people begin to see the possible advantages.